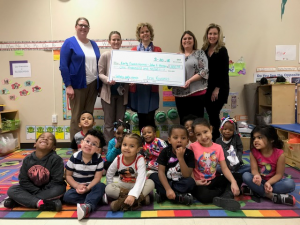 Early Connections staff and children are thankful to the Kiwanis Club of Erie for donating $1,000 that was used to purchase books for our children and a secure gate system inside the Early Connections John E. Horan Garden Apartments location. Kiwanis member, Shannon Wohlford, was also the guest reader. Standing behind our beautiful children from left to right: Kate Beer, Early Connections Director; Angela Griffith, Early Connections Teacher; Shannon Wohlford, Marketing and Communications at the Sight Center of NWPA and Kiwanis Member; Nikki Parsons, Early Connections Teacher; and Michelle Harkins, Early Connections Associate Executive Director.